About two years ago, I bought the Bourke Street Bakery Cookbook, thanks to a gift voucher from some family members. Now, I’ve never been to the Bourke Street Bakery due to Melbourne-ness and the fact that we never seem to have time when we occasionally go to Sydney, but I had read so much about it and was keen to try out some of the recipes in the book. I’d also been thinking about wanting to expand my bread making repertoire: I went through a stage of making our bread but it was a fairly boring plain white loaf which was hard to get enthusiastic about. After leafing through the book, what I needed was sourdough. I love sourdough. The texture, the taste, the way it makes everything tastier — sourdough is a total winner. And, more correctly, what I needed was a sourdough starter. I’m not going to say it wasn’t disheartening when I read about starting a starter in the Bourke Street Bakery book and realising that it would be about a month before I could even make a loaf of bread. And that I would be caring for this starter like it was another pet (which we had four of at the time). And there was still the possibility that it would all go wrong and some sort of chemical shenanigans would render my starter sad and unusable. 1. I love bread making and I love working with yeast. 2. I actually find the time that bread making takes is really quite relaxing and therapeutic. 3. This is like making my own yeast! 4. It takes even longer! 5. It results in sourdough. So I started a starter. I needed to make it like a member of the family so that I remembered to care for it. And so Stefan was born. I worked hard on Stefan – feeding him, watching him grow, throwing a bunch of him out on a regular basis. He made delicious bread the few times I actually got to use him. I wrote detailed instructions for people house-sitting as to what he needed and when. Sadly, however, we moved house. And I became a starter murderer. Look, it wasn’t on purpose! He was moved with the utmost of care! I tried to reinvigorate my love of feeding and caring for him! It just wasn’t happening. I let him languish and he died. I murdered Stefan. In the last two weeks, I decided it was time to start again. Note: this picture is from a week or so ago. She is much bubblier now. She seems strong and healthy so far. I’ll keep you updated on how she’s going and, obviously, the delicious things she helps us bake. rip stefan. he was the best hawk-handler we ever knew. 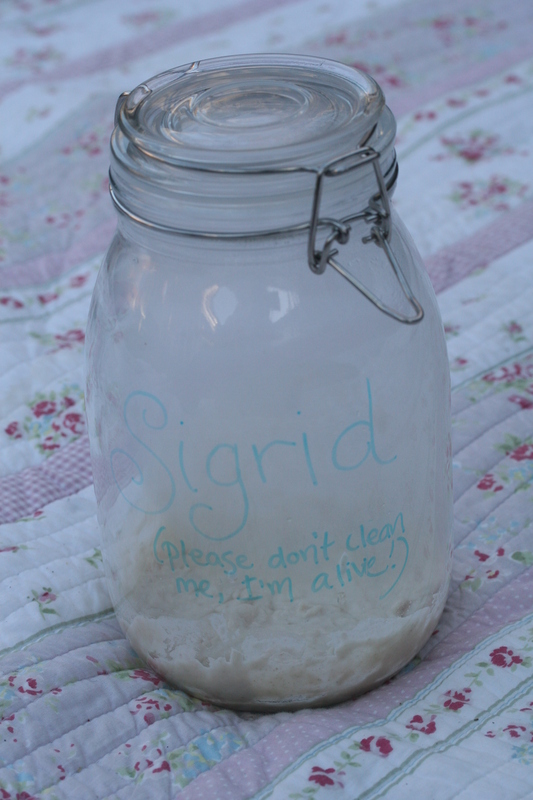 Sigrid looked SO good last night… mmmmmmm Sourdough!! I love this! The next will be Herrmann, for sure. it may be of interest to you?